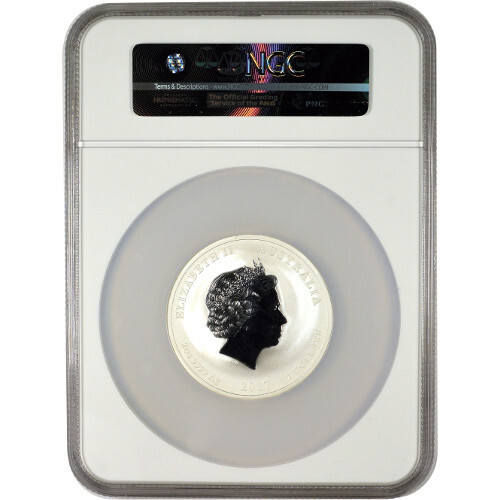 The Lunar Series II collection of silver and gold coins from the Perth Mint are highly anticipated each year by both investors and collectors. The .9999 purity of both the silver and gold releases make these coins ideal for investors, while collectors covet them for the changing designs on the reverse with each new release. The 2017 2 oz Silver Australian Rooster Coin is available today from Silver.com. Issued a face value of $2 (AUD) by the Australian government. 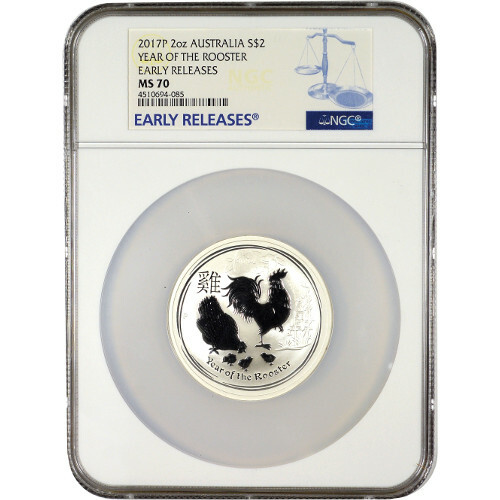 Each of the 2017 2 oz Australian Silver Rooster Coins in this listing is a perfect specimen according to the NGC. Coins in MS70 condition include full, original mint luster and feature no detracting flaws of any kind on its surface areas. It is also an early release coin. The gold and silver versions of the Year of the Rooster coins from the Perth Mint each have different designs. The gold coins feature only a rooster, while all of the coins in the Silver Australian Rooster release feature a rooster along with a hen and three chicks. The obverse side of all 2017 Silver Australian Rooster coins features the right-profile portrait of Queen Elizabeth II. Her Majesty’s image is surrounded by engravings that include her name, the nation of issue, year of issue, face value, and the coin’s weight, purity, and metal content. On the reverse of each 2017 2 oz Silver Australian Rooster is the Year of the Rooster design mentioned above, along with engravings that read “Year of the Rooster,” a “P” mint mark from the Perth Mint, and the Chinese symbol for rooster. The Perth Mint is a state-owned facility of Western Australia. Though it is the nation’s oldest operating mint, founded in 1899, it is not the sovereign mint of Australia. The Currency Act of 1965, which established legal tender status for Perth Mint coins, also marked the founding of the Royal Australian Mint in Canberra as the sovereign mint of the nation. We encourage Silver.com customers to ask questions. Our customer service team is available on the phone at 888-989-7223, online using our live web chat, and via our email address.